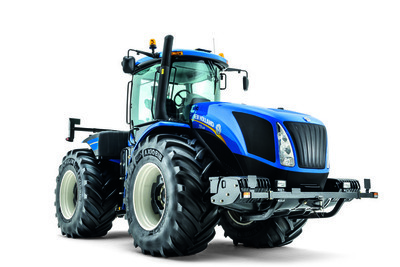 The T9 family is the most powerful New Holland tractor range. It provides large-scale farms with a simple and high-performance solution to increase site flows. The T9 combines in a unique way, a particularly low operating cost, a very high comfort level for the operator and a limited impact on the ground thanks to its large tires. "The T9, in its standard chassis version, has been developed for the European markets to provide a tractor that can use large diameter 900 mm wide tires within 3 m To facilitate road travel, "said Luca Mainardi, Head of Development for Tractors and Precision Agriculture. "Wide chassis models have a reinforced structure that is very well suited to large areas, cereals and large farms whose width of towed tools is accompanied by more tolerant road regulations. The offer of modern tires of very large size preserves the soil at work as well as during the maneuvers in pound and improves the comfort of the operator during the movements between parcels. " The T9 meets the Tier 4B standard for emissions from engines using state-of-the-art HI-eSCR ECOBlue ™ technology, which New Holland has adopted for its high-horsepower tractors. It benefits from the highest conversion efficiency of nitrogen oxides with 95% conversion and offers many benefits to its users. Firstly, it is an evolution of the ECOBlue ™ solution for Tier 4A and there is therefore no change in the operation of the hardware. These engines are characterized by the absence of particle filter and exhaust gas recirculation (EGR), guaranteeing nervousness, reliability over time and control of fuel consumption. Developments focused on improving the overall efficiency of engines with low fuel consumption and AdBlue. Thanks to the simplicity of its implementation, they can provide power equal to or higher than that of the previous generation. Spacious and luminous, the design of the cab makes you forget the impressive dimensions of the T9 and gives the operator a perfect mastery of his working environment. The interior design makes the work easier and more comfortable. The award-winning SideWinder ™ II armrest offers unparalleled ergonomics that puts all controls at your fingertips. The CommandGrip ™ multi-function handle supports the most commonly used functions. Ultra Command ™ gear shifting, forward speed control, IntelliSteer ™ auto-steering and headlamp automation are placed on the multi-function grip for intuitive operation. This grip has been further improved with more responsive and backlit pushbuttons. A knob has been integrated to facilitate the setting of the target speed when the GSM transmission management automation is activated in the field. The T9 provides the best hydraulic performance in its class with up to eight rear auxiliary valves. The standard pump produces a flow rate of 159 l / min. An optional high flow pump provides up to 216 l / min which can be increased to 428 l / min when combined with the Mega Flow ™ pump. With such hydraulic power, the T9 is able to work easily with the most demanding tools in hydraulic flow. The SideWinder II armrest has four paddles to control the auxiliary valves and the remaining four valves are activated from the CommandGrip handle or together with the CommandGrip handle and two additional pallets. For some applications, our customers have expressed a preference for ordering vending machines by pallets rather than by joystick; We have added a new module of two pallets, bringing to six the number of dispensers ordered per pallet. The new generation of the T9 also introduces a new PTO box which allows to obtain 1000 rpm at engine speed of 1800 rpm instead of 2000 rpm, on previous models. The result is an even quieter cab, less vibration and less fuel consumption. More savings and more comfort for the operator.